Palladium XenForo 2 Style is named under the name of Palladium chemical element with symbol Pd and atomic number 46. It is a rare and lustrous silvery-white metal discovered in 1803 by William Hyde Wollaston. He named it after the asteroid Pallas, which was itself named after the epithet of the Greek goddess Athena, acquired by her when she slew Pallas. The design of Palladium is pretty simple. Just the navigation bar is stylized a little bit to make it in cubidform. 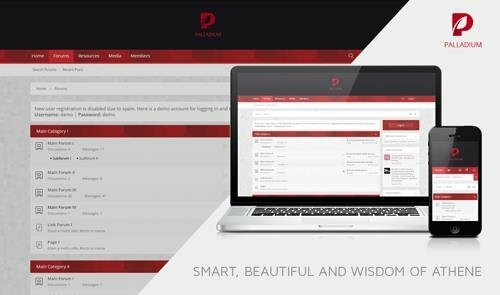 The whole forum is kept in the milk-white color, and also the header and footer are black, while the bars in all forums are red one – The color of strength and wisdom of Athena. Pick the Palladium to have what human desire about for your whole life. 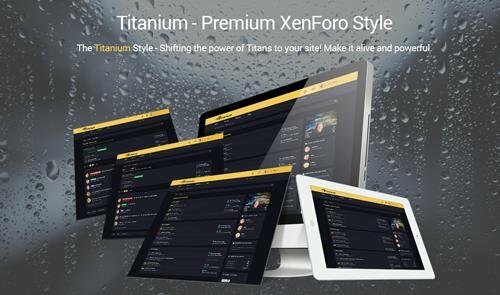 "Titanium" for XenForo 2, It is the name which is inspired by Giant Titan gods on Greek myth. By their powerful strength, they created other gods and then they were defeated by their own children (The Gods of Olympus). To take that to our inspiration, we create Titanium style with the yellow color which will bring “the power of gods” for who owns it. We use the black background to remind us about the early years of the human when they needed protection from gods. With robust and giant design style, we hope to deliver to you “willpower and energy” from ancients time to make your site alive. Catching up with the newest technology is our mission and vision. In Brivium, we desire to bring to our customers the newest experiences in the fastest time. 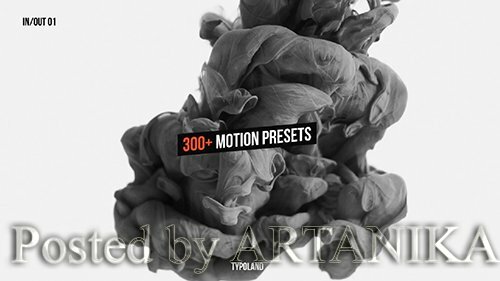 That is why we created this style. 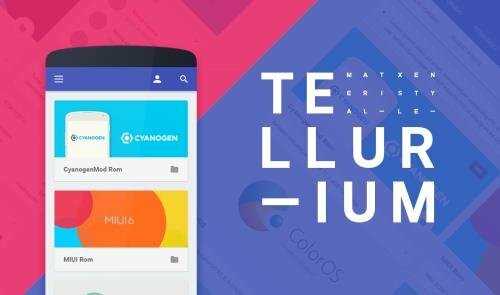 Tellurium is an amazing combination between the XenForo platform and Material Design of Google. You can easily experience the interaction with the users just in one screen. Color transformation with Vanadium and easily switch as your wish. 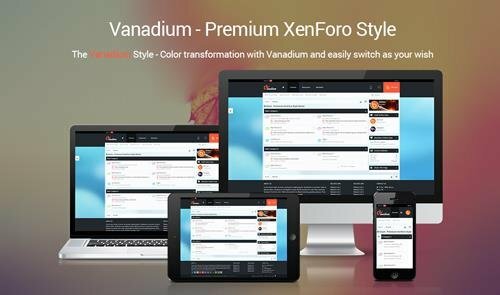 Vanadium built in Stylium Framework which is flexible with robust tools, you don't have to be CSS ninja, or HTML geek to do the customization. Modernize your forum’s discussions with Post Comments. Like Reddit and Facebook, keep your post replies inline so the discussion is relative and easy to follow. With Post Comments, your users can comment on each other’s posts without disrupting the thread or having private conversations. Users are familiar with and expect this type of discussion format. Do more than just "like", let your users react to posts in your community. Set up which reactions best fit your forum. Sad, love, cheers, truth, custom emojis, custom icons, you name it. 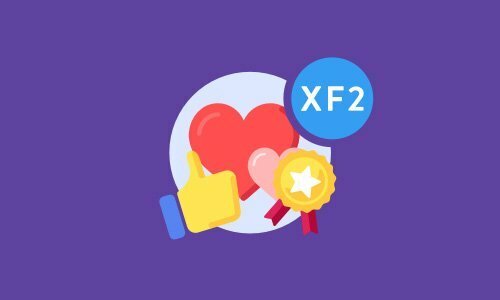 This idea was popularized by Facebook and an integration your forum users will really love. 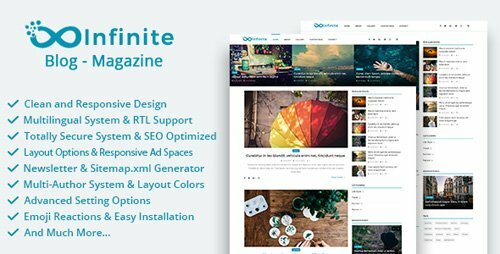 Infinite is a multi-purpose blog-magazine script. It has clean, responsive and user-friendly design. 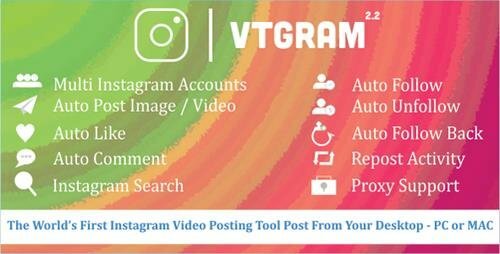 You can manage your posts, custom pages, categories, user comments, advanced settings and contact messages with its powerful Admin panel. Also it has a useful ad management system. You can manage your ad spaces with this system. It is secured, seo optimized, fast and easy to use. 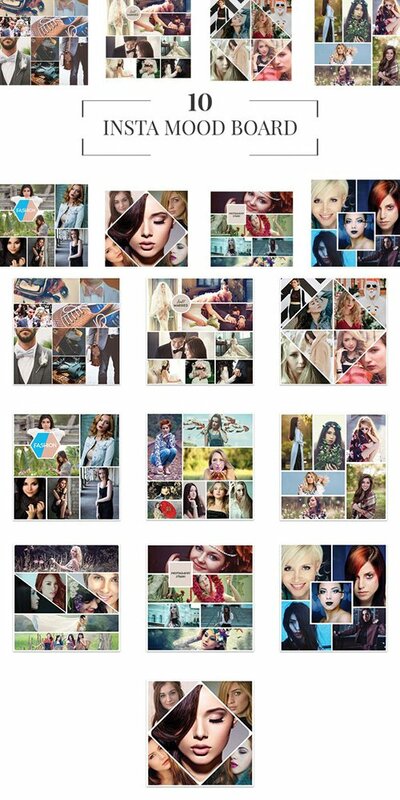 Stellar Video Player is a premium multi-purpose video player. Stellar player supports YouTube playlists/channels/single videos, Vimeo videos, self-hosted HTML5 videos (only mp4 required), Google drive videos, Dropbox videos, local videos, Amazon s3, LiveStreaming HLS m3u8 videos, basically everything that you’ll need from HTML5 player. No coding or technical skills required. 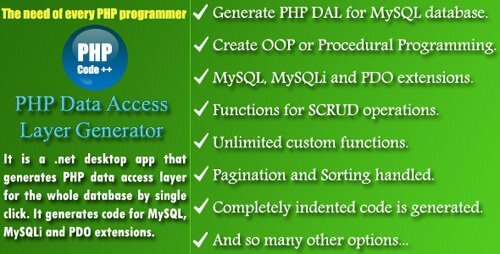 PHP DAL Generator is a .Net desktop application that generates data access layer for MySQL database. It generates code for MySQL, MySQLi and PDO extensions. This software makes PHP development easy. This tool is specially useful for programmers who don’t want to (or cannot) use a CMS. Programmers have complete control over the generated code and can be modified easily because the generated code is very clean. ACADEMY is a marketplace script for online learning. Here students and teachers are combined together for sharing knowledge through a structured course based system. Teachers or instructors can create unlimited number of courses, upload videos and documents according to their expertise and students can enroll to these courses and make themselves skilled anytime and from anywhere. So start selling your courses by installing ACADEMY and make your online business today. 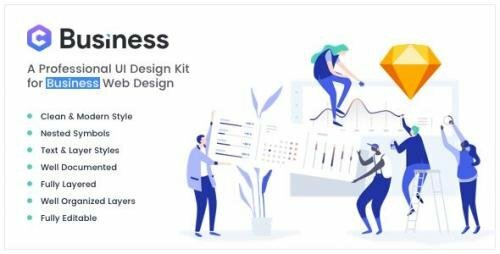 It is a UDEMY clone! A php script that allows visitors to your site to make money from your site just by sharing a referral link that was created when they visited. 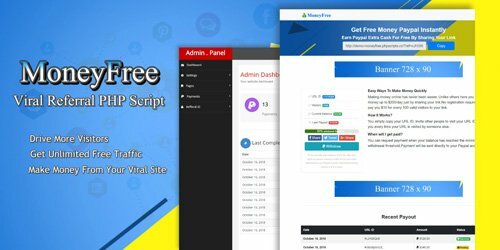 This script works based on the IP address and visitor browser cookies, so each visitor will have their own unique referral link. Each visitor will be paid based on the number of visits in their referral link. What are the benefits for website owners? As an owner, you can determine rate per visitor and minimum withdrawal threshold. If you set a rate of $10 for 100 visitors and $20 for a minimum withdrawal, then people must send at least 200 visitors to request a withdrawal and this will create a viral effect.This system will help your site become viral! When each visitor drive more visitors to your site, you will get unlimited free traffic. 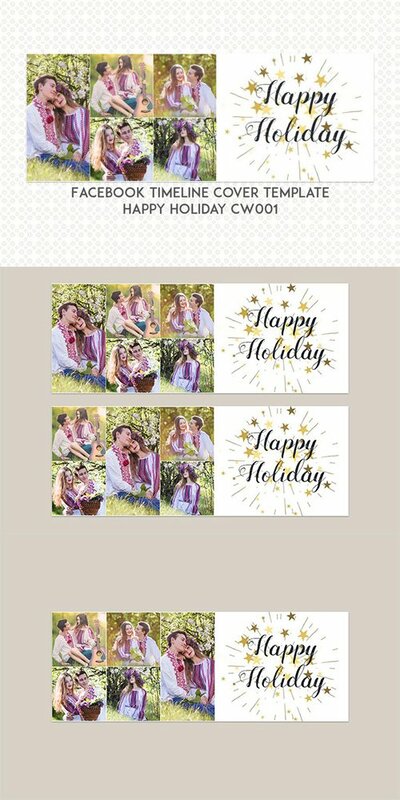 Imagine for example that in each 10 visitors must send at least 200 more visitors to make a withdrawal, then you will get 2000 visitors from just the first 10 visitors. This strategy will quickly be growing your site virally!